In the first real indication of how North Korea nuclear talks will proceed after the collapse of the Hanoi summit, President Donald Trump will host South Korean President Moon Jae-in at the White House on Thursday, as the two leaders try to map out a path together. Six weeks after Trump's meeting in Vietnam with North Korea's Kim Jong Un abruptly ended without a deal, Moon will be pushing to keep the momentum going and keep Trump engaged, according to South Korean officials. But to do so, he also will be advocating for a smaller, short-term deal with North Korea, to keep Kim confident in negotiations and advance his own agenda of improving inter-Korean relations. That's a strategy that could backfire and expose a rift with the U.S., as the Trump administration has so far laid down an all-or-nothing strategy that requires North Korea to give up all of its weapons of mass destruction to get sanctions relief. 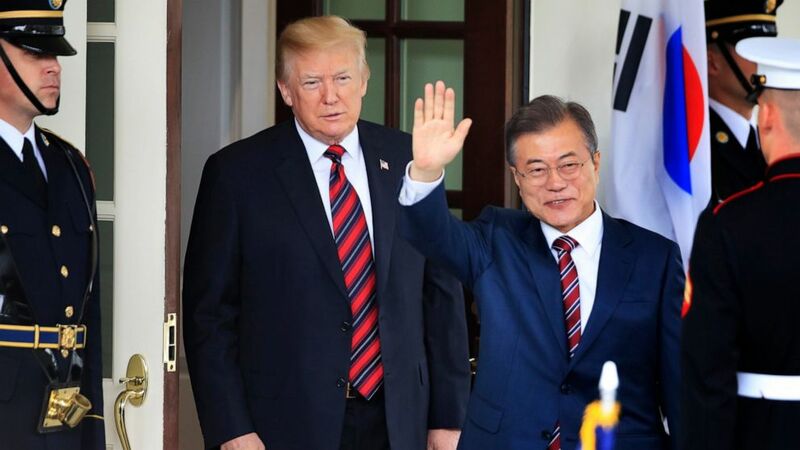 South Korean President Moon Jae-in waves as he is welcomed by President Donald Trump to the White House in Washington, May 22, 2018. Since Hanoi, nuclear talks have ground to a halt, with no working-level meetings between the U.S. and North Korea. But North Korea has also disengaged with South Korea, ignoring deadlines to work together on recovering remains from the Korean War and working on maritime border issues. Trump asked Moon to call Kim after the summit to prod him, but the two Korean leaders haven't spoken, according to Moon Chung-in, the president's special adviser on unification, diplomacy and national security. "President Moon wants that momentum would be restored and both parties, the U.S. and North Korea, would work closely within the existing framework of dialogue and negotiation, and he wants that they would come up with some kind of new interim agreement," said Chung-in. While Chung-in has an official title, he said he was speaking in his personal capacity -- but the director of South Korea's National Security Office Chung Eui Yong said last month their government is advocating for an "early harvest." While the Blue House -- the office for South Korea's president -- has not specified what that means, analysts say it's a smaller deal to keep both sides invested in talks. For example, North Korea could finally allow international inspectors to verify the missile and nuclear sites they claim to have destroyed, a promise they made last year but still haven't fulfilled, and in exchange, the U.S. could grant small sanctions relief to allow for inter-Korean economic projects, like the Kaesong industrial project North and South Korea used to operate jointly. "Within the framework of the sanctions, we are going to find some possible ways to increase cooperation with North Korea, and we will be able to form a virtuous cycle to push North Korea together, the United States and the Republic of Korea," Moon Hee Sang, the speaker of South Korea's National Assembly and an ally of the South Korean president, told ABC News. President Donald Trump looks towards North Korean leader Kim Jong Un during their one-on-one bilateral meeting at the second North Korea-U.S. summit in Hanoi, Vietnam, Feb. 28, 2019. Secretary of State Mike Pompeo, the White House's point person on North Korea talks, seemed to indicate a willingness to consider that while testifying before the Senate on Wednesday. He said there are "particular provisions that if we were making substantial progress," the administration would approve. "I want to leave a little space there," he added, while assuring lawmakers it would not mean any lifting of United Nations Security Council sanctions. 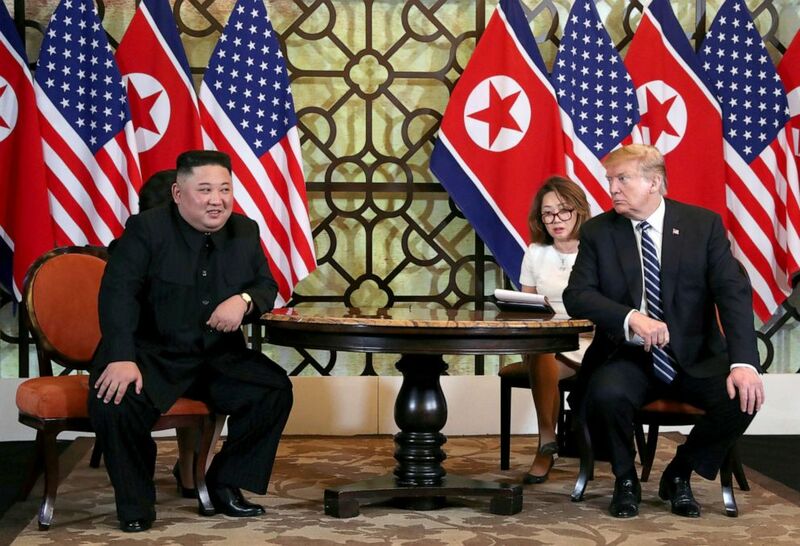 In Hanoi, Kim asked Trump to lift all economic U.N. sanctions on North Korea in exchange for the dismantlement of the Yongbyon nuclear facility, the heart of North Korea's nuclear program. But Trump said no because the deal did nothing to dismantle North Korea's existing nuclear stockpile, secret nuclear sites, or ballistic missile, chemical weapons and biological weapons programs -- what the U.S. considers "complete denuclearization." The Trump administration has been firm since then that there will be no sanctions relief until North Korea denuclearizes -- while Kim's advisers have said publicly that they will not change their position, intent on getting sanctions relief first. Kim himself said Thursday that his regime would "deal a blow to those bent on the misjudgment that they can bring us to our knees with sanctions," according to South Korea's Yonhap News Agency. 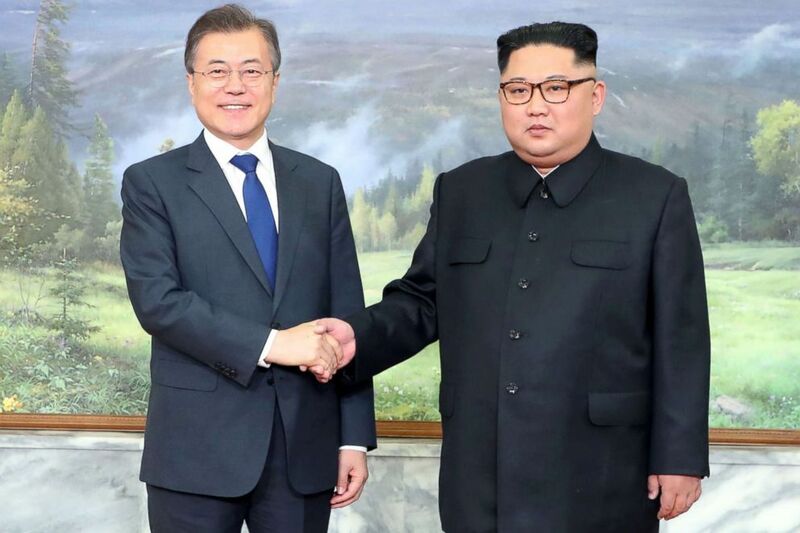 That leaves Moon in the middle, advocating for what the Blue House calls a "good enough deal" -- one that is as comprehensive as the U.S. demands, but has a step-by-step approach to satisfy North Korea. Analysts are concerned that in their meeting Thursday, Moon may push Trump too hard on sanctions relief, exposing a divide in the U.S.-South Korean alliance. South Korea's President Moon Jae-in (L) shakes hands with North Korea's leader Kim Jong Un before their second summit at the north side of the truce village of Panmunjom in the Demilitarized Zone (DMZ) on May 26, 2018. "My concern is that Korean government might focus again on the importance of lifting of sanctions to bring North Korea back to the table," said Shin Beom Chol, director of North Korean Military Studies at the Korea Institute for Defense Analyses in Seoul. "That’s a kind of point of collision between the United States and Korean governments" because the U.S. says the pressure of sanctions will keep Kim at the table, while South Korea thinks only lifting them will keep him there, Shin added. But South Korea bristles at the idea that they are not in step with the U.S. or that they are advocating for sanctions relief: "South Korea does not have any inclination to ease or lift sanctions on North Korea alone. ... Please don't suspect South Korea of that," Speaker Moon told ABC News. Whatever comes out of his meeting with Trump, South Korea's president will move to send a high-level envoy to North Korea afterwards and resume his role as facilitator between Trump and Kim. That envoy could even be Moon himself, according to a South Korean official. "We are working on it very, very seriously," the official said, adding that Kim "would be eager to hear what Trump has to say right" from Moon. "And with that, our posture will be much more strengthened, and what's what the allies do." Reporting for this story was made possible by the Atlantic Council Korea Journalist Fellowship Program. The fellowship was sponsored by the Atlantic Council, a nonpartisan think tank in Washington in partnership with the Korea Foundation.